BKR Pros is a leading residential, industrial and commercial remodeling company with affiliates in Buffalo, NY. We have more than 20 years experience in all phases of remodeling and specialize in custom shower and bathroom renovations. We stay current with trends and use the best in technology keeping us on the cutting edge of the cutting, removal, and remodeling industry. Plan for enough plug-ins. If you have two curling irons and a hair dryer near your shower, you'll need more than one outlet. Put everything in it's place. Purchase drawer organizers for cosmetic and hooks for hanging your hair dryer and curling iron in the bathroom. Light it right. If possible, light the cosmetic center to duplicate the lighting in the place where you're preparing to spend the most time. That is, if you work in a setting with fluorescent lighting, your makeup center should have fluorescent lighting. Plan the proper distance between the mirror and shower. When applying eye makeup or lipstick, it's hard to get close enough to the vanity mirror, so supplement it with a hand mirror. Place the center out of high-traffic areas so you're not jostled as you apply makeup. Take some time to work through some of the physical constraints fixtures place on design and how concerns of privacy, ventilation, water usage, lighting, storage and safety can all influence the bath or custom shower you want to create. We've handled dozes of renovations in Buffalo this year and can assist with any questions you might have. Also, if you're unsure of how to proceed, by all means consult with us so that you're sure your plan is the right one for you and your home. 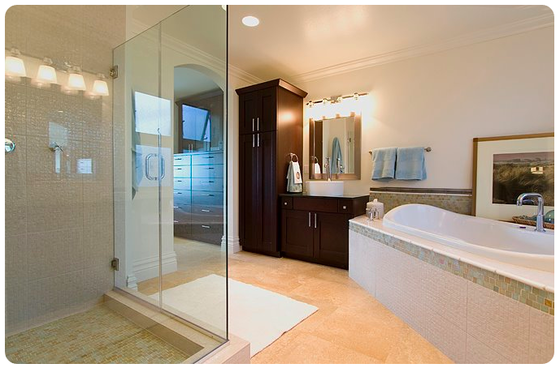 Knowing the details of bath and shower design can help you design the perfect bath. Placing lighting on either side of a mirror rather than above, as an example, provides good lighting for applying cosmetics or shaving. Also, at least 8 inches should separate the top of the vanity backsplash from the bottom of the medicine or cabinet. Standard height for bathroom vanities is 32 inches as a general rule. Adjust height upward for tall users. In bathrooms with two vanities, you can have them be different heights to accommodate your family. Dividing walls are normally about 6 inches thick so allow space for them.